Today STITCHES South begins. Not only does this conference mark my first anniversary of being with XRX, Inc. as a full-time employee, but it also brings back memories of last year’s fun by celebrating my debut with then-newlywed Jessica and birthday-girl Lauren. (I am waving “Hello!” to them as I type…) It was their first ever yarn-fested event, and they loved it. Hopefully next month I will see Jessica at Maryland Sheep and Wool. 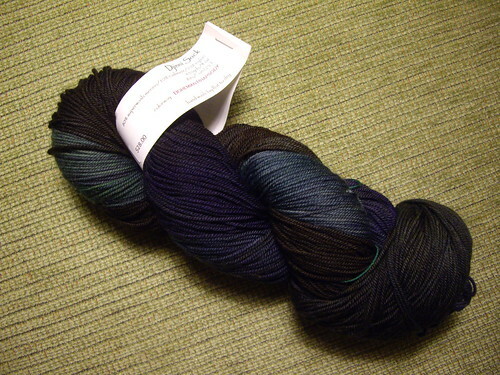 Meanwhile Lauren has been busy dyeing fiber and working at the LYS where she lives. If we cannot see each other soon, there are many festivals and events where we will run into each other in the future. Right?? These delightful friends along with Kathy in Georgia, Jenny Raymond of Jonquil Designs, Doreen Ray and Karola Wright helped me last year during STITCHES South. (I am hoping some of them along with Aimee Abernathy will be able to help this year too!). Meanwhile, I do have a slight announcement to make about the Pajama Party I am throwing for Friday night after the Fashion Show and dinner. Need to ask? hehe… It is about the very cool prizes that have been donated for our fun! 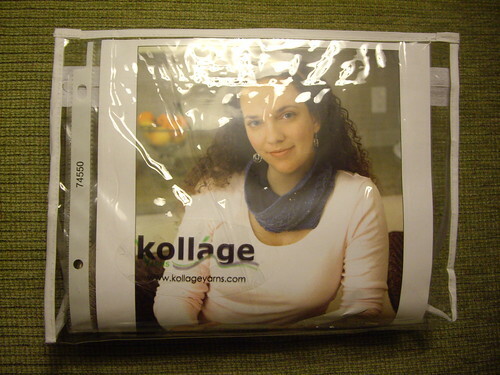 Another Sponsor, Susan Moraca of Kollage Yarns has generously donated 10 cowl kits which use Riveting yarn. These cotton yarns are made out of recycled denim blue jeans and make an incredible fabric. Now I do not know how I did this, but I blame the yarn fumes that surrounded me during CampKIP. 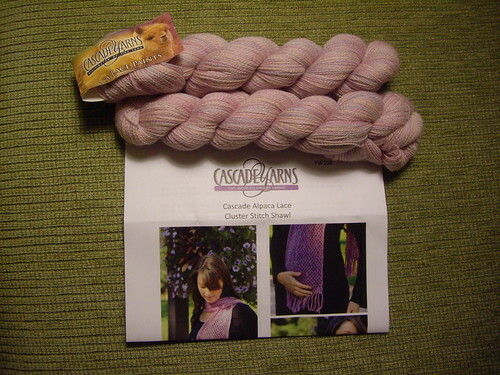 I discovered that this really cool sock yarn company was featured in a 2007 Yarn Harlot post. 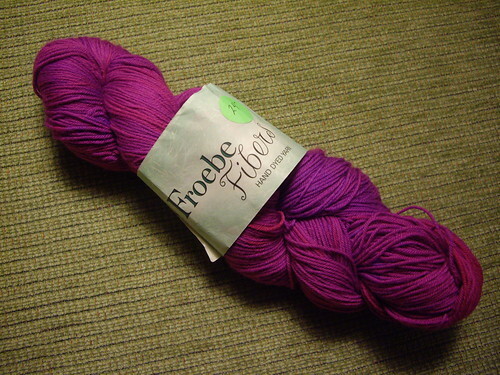 Better yet, Froebe Fibers has kindly donated a skein of their newest colorway for the party! With all their colorways named after adult beverages, this one is “Purple Viking.” I like it! This next bit of prizes are pretty neat in my humble opinion. 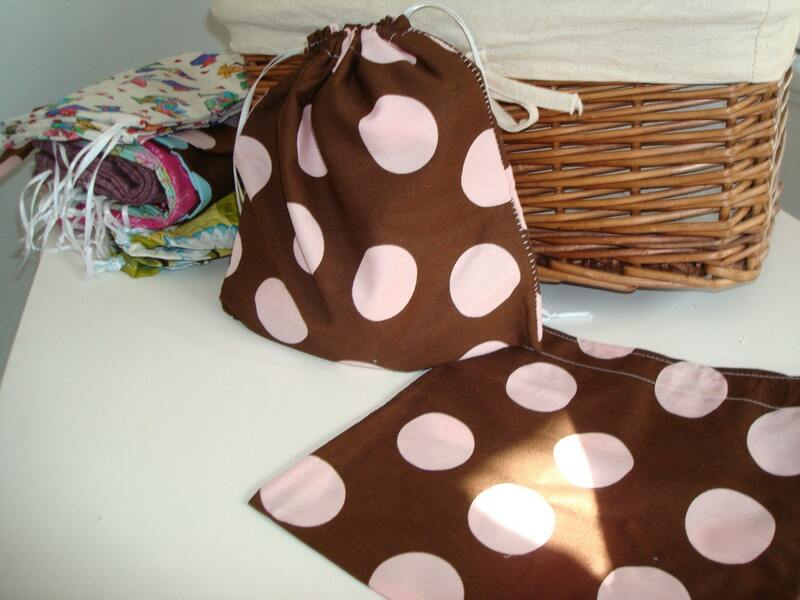 The awesome Aimee Abernathy is donating project bags and lavender sachets. Already smitten with her knitting and overall goodness, I knew that each set would make an equally awesome prize. 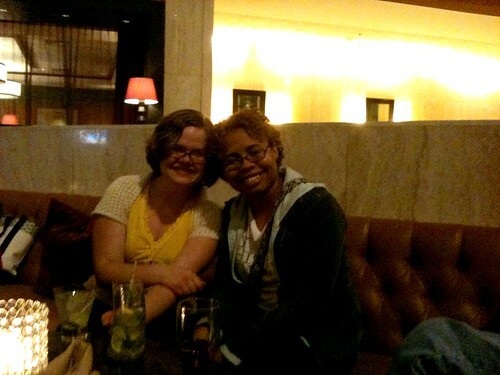 During STITCHES Midwest, I finally was able to meet my online friend Laurie, aka “Mooflower” in person. She makes these gorgeous Swarovski crystal stitch markers, and is donating a set for the party too! I am not sure which color they are yet, but take a peek at her website to drool on this crystal beauties. And finally, the grand prize for the night is something I would love to have. Jan Mitchell is an artist in the Virgin Islands who loves being a part of STITCHES, and it shows in her never-ending smile when ask her about it. 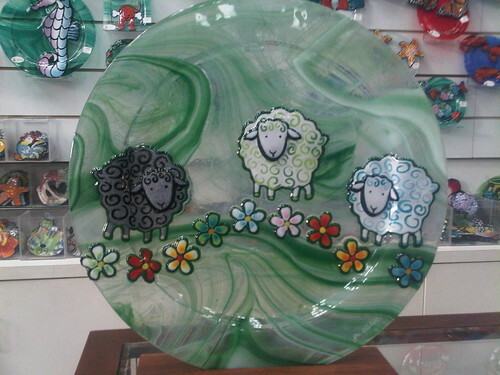 She is donating one of her large glass sheep platters! Be still my heart. This platter is so gorgeous in person. What do you think of the prizes so far? I have a feeling that more will be popping up unexpectedly like they did at STITCHES Midwest. If so, stay tuned to see who else appears on this list!